High quality keystrokes for both gamers and typists. With an improved build and new features, the fourth generation of the Das Keyboard is the best version yet. Das Keyboard has become synonymous with quality in the keyboard world. First introduced with blank keycaps to lure out the ninja typists, Metadot’s Das Keyboard lineup has earned a special place in the heart of typists and gamers alike. The fourth generation of the company’s acclaimed flagship brings a face lift and a nice helping of new features. Metadot has finally rid its keyboard of the dreadful glossy plastic front cover. In its place is a beautiful, sand-blasted aluminum plate. The weight of the metal adds heft and quality feel to the board. Its grainy texture is excellent at warding off fingerprints and the like. The lips of the front plate extend beyond the base so the keyboard can be easily lifted. All this makes it one of the best gaming keyboards you can buy. Want more keyboard action? Check out our guide to the best gaming keyboards. 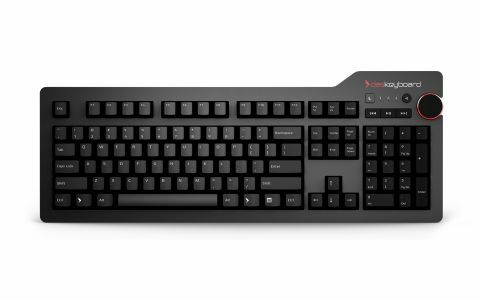 To satisfy audiences in both gaming and typing fields, the Das Keyboard 4 Professional is being offered with Cherry MX Blue or Cherry MX Brown switches. The clicky Cherry MX Blues provide a luxury typing experience with their 60g actuation force and a pronounced tactile bump. The quiet Cherry MX Browns offer great feedback, but are also lighter and more responsive to give gamers the fast action they need. Typing experience with the Cherry MX switches is fantastic as always. Our version has the Cherry MX Brown, the jack-of-all-trades switch. The key travel is smooth and tactile, but we had to add a wrist rest to avoid wrist cramps, which isn't the fault of the keyboard itself. Costar stabilizers are installed under the larger keys. Oddly, the left Shift key squeaks a little when pressed quickly. This indicates that the stabilizer bar is not adequately lubricated. But since there’s a ton of factors that can affect lubrication and that the left Shift key is the only key that exhibits this, we’re not going to chalk it up as a manufacturing defect. The keycaps on the Das Keyboard 4 Professional are laser-etched on ABS plastic—the most common combination used for most keyboards. With that said, the plastic itself seems to be dyed in black instead of just coated in black. This should alleviate the yellowing effect of ABS that occurs overtime due to exposure to UV rays. Not the same could be said about the key prints, though, since in our experience anything laser etched stains easily with use. Like its older siblings, the Das Keyboard 4 Professional still supports N-Key Rollover. It’s disabled by default to ensure compatibility with older motherboards. To toggle between modes, simply press shift and mute. The addition of a volume knob turns the tedious chore of sound management into something that’s actually enjoyable. On a keyboard with nothing but straight edges, the round silhouette of the volume knob is also especially eye-catching. A set of playback controls and an emergency sleep button sits to its left; they’re only slightly raised against the chassis as to not draw away from the flush, sleek look. Pointing towards the front are two USB 3.0 pass-throughs. Metadot allocated them to the front so devices that are plugged in won’t bump into your hand. We would’ve liked to see backlighting for the night owls in dark caves, but in the case of the Das, the absence of backlight can actually be a bonus. Typically, keyboards with both USB pass-throughs and backlighting need two USB ports to function: one for the backlight and the other for the pass-throughs. Having no backlight means that the keyboard doesn’t need an additional USB plug for extra power (this will eventually become a non-issue with the gradual adoption of USB Type-C connector and the USB Power Delivery V2.0 specification)—great news for users who wants to maximize the number of ports available to them. Most users can probably get by without fancy backlight, but the lack of macros can be a potential deal breaker for some. In some genres, such as MMOs, a set of macros can come in very handy. The lack thereof further shifts the purpose of the board towards the typing crowd rather than gaming. You won’t find elevator feet on the keyboard’s backside. Metadot apparently “got tired of those itty bitty plastic keyboard feet” and decided to use a magnetically-attached footbar instead. We like different, but the footbar is slippery and annoying to have lying around. Oh, it doubles as a ruler, too. Why a ruler? Not even Metadot knows. Maybe you can use it to beat your typos into submission. Rumors stirred that the Das Keyboard 4 series suffers from poor quality control after Metadot started using Cherry MX Clones in some of its keyboards, namely the Das Keyboard 4C. Some went as far as accusing the Das Keyboard 4 series of being inferior in quality compared to previous generations. To set you at ease, we tore the board open for a closer inspection: the joints received good coverage with appropriate amount of solder, no excessive leads were sticking out, and there was good separation between the joints. While we can’t conclude on the longevity of the PCB and the soldering material, there are no immediately noticeable shortcuts when it comes to manufacturing. The fourth iteration of the Das Keyboard is definitely the company’s best one yet. The new features and design changes make an already superb keyboard even better. Unfortunately, quality doesn’t come cheap. With solid performance and a reputation to match, the Das Keyboard 4 Professional will cost you $161. At this price, buyers should seriously contemplate on whether it’s the right choice for them to sacrifice macros and backlighting. To us, the Das Keyboard 4 Professional is an excellent office keyboard and an easy recommendation to any productive individual.